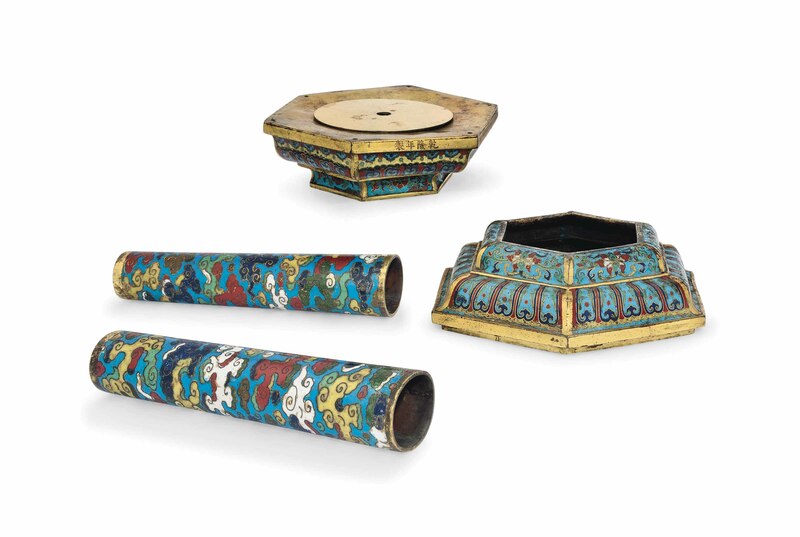 Each fitting is of hollow cylindrical form decorated with dense cloud scrolls reserved on a turquoise ground. The hexagonal stands are decorated with bands of lappets and ruyi below panels containing florets. The rims are gilt. See a similar pair in the Pierre Uldry Collection illustrated in Helmut Brinker and Albert Lutz, Chinesisches Cloisonné, Die Sammlung Pierre Uldry Museum Rietberg, Zurich, 1985, no. 217.